Kentucky is well known for bourbon distilleries but lesser known is the burgeoning craft brewery and winery scene. Kentucky is now home to over 50 breweries and 70 wineries. On the Spirits of the Bluegrass Tour you'll tour Town Branch Distillery with tastings and then stop by Rock House Brewery for a tour, a flight and a discussion with owner Kevin. The last stop on the tour will be at Wildside Winery in Versailles, KY for a tour, flight, and discussion with owner Neil. 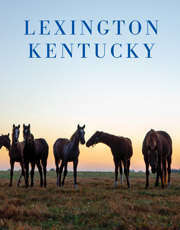 Pickup is at the Lexington Visitors Center. The tour is approximately 4-5 hours. Water and snacks will be provided. Price includes a tour at Town Branch and tastings at all three locations.